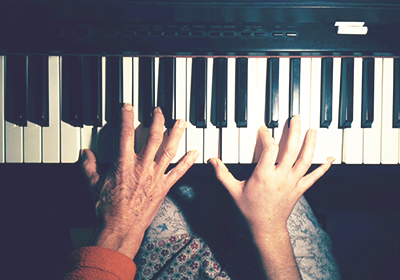 Intergenerational music programs have been shown to add to the well-being of both younger and older participants. Learning more about why parents want their children involved in intergenerational programs may be helpful when creating and promoting future programs. Intergenerational music programs have been shown to contribute to the well-being of both younger and older participants. These programs can also help to break down stereotypes and address ageist beliefs about older adults and the aging process in younger participants. There is not a lot of research exploring intergenerational music programming with very young children (ages 0-4) and their parents. The music program being studied involves parents and their children so it is a unique opportunity to examine the parent’s rationale for including children in the program, to observe interactions between very young children and older adults in a musical setting, and to identify potential benefits for the adults accompanying the children as well. The researcher will attend the music program on four separate occasions: the first and second classes, while the group is still forming, and the participants are getting to know one another, the fourth class, representing the midway point in the term, and the last class. The researcher will also interview the music therapist after each class and observe the class to see what worked well and what could be improved. Parents will be interviewed after the first class and after the final session. They will be asked what led them to sign their child(ren) up for the program and also about their overall experience and any recommended changes.